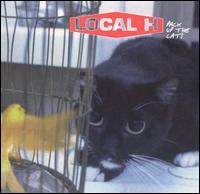 Local H is probably my favorite band. I have seen them nearly two dozen times live in concert. I even saw them play at 9AM on Sunday morning at U.S. Cellular Field in Chicago, despite my absolute hatred of the White Sox. That is how much I like this band. They are very accessible to the fans signing autographs, drinking with the fans after shows, and selling their own merch after a 2 hour set. This song is from the severely underrated Pack Up the Cats. It is on my "My Desert Island Top 13 Albums of All Times" list. It was even #20 on Spin magazine's Top 20 Albums of 1998. The album is a concept album about a guy moving to the big city from Small Town, USA to make it big in the music industry. I suppose it's semi-autobiographical, because that's what lead singer/guitarist Scott Lucas did. The album got lost in a label merger between Island Records' parent company Polygram and Universal. It was eventually not promoted and the band was dropped. The song is a rockin' little number about some guy who is a literal magnet of all that is cool. There's strong cowbell in the intro and in the breakdown. Keep an ear out for the blistering lead at the end from Stone Temple Pilots' Dean DeLeo. The song and the cowbell starts at 1:05.